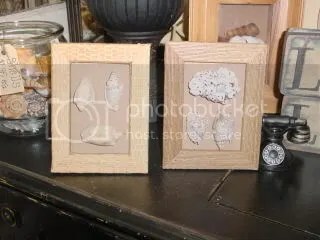 Found these inexpensive wicker/rattan type frames and thought they’d be perfect for framing some sea shells to add to my shabby beach cottage decor. My flash kind of washed out the color in this photo, so you probably can’t tell what I used for the backing to glue the shells to. . . . what else but SANDPAPER!